Kaleshwaram is the abode of Sri Kaleswara Muktheswara Swamy Temple. The primary deities of this ancient temple are Lord Yama and Lord Shiva in the sanctum sanctorum. The other main deities are Goddess Subhaanandha Devi(Consort of Lord Muktheswara Swamy) and Goddess Maha Saraswathi Devi. The temple town Kaleshwaram is located on the banks of river Godavari in Mahadevpur mandal of Karimnagar, Telangana. This ancient temple is a unique mandir as it houses two(2) Linga's on the same platform in Garbhagriha. 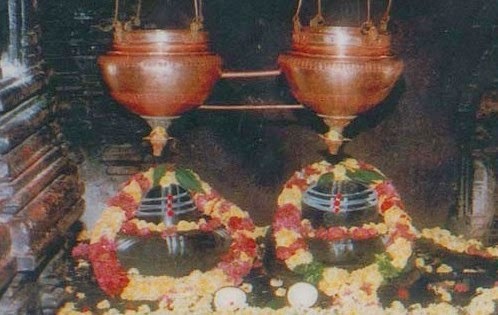 It is believed that One Linga is manifestation of Kaleshwara(Lord Yama-God of Death) and other Linga is Lord Shiva as Sri Muktheswara Swamy(God of Destruction) in this temple. The temple town Kaleshwaram is also known as "Dakshina Triveni Sangam" where the river Godavari meets its tributary river "Pranahita" and third river "Saraswati" believed to flow as Antarvahini(invisible river). Thousands of Pilgrims visit Kaleshwaram temple to take a holy bath in sacred river Godavari during major temple festival and Godavari and Saraswati Pushkarams("Festival of Rivers" held for every 12 years). Maha Shivaratri(in the month of February/March); Kalyanotsavam is performed to Lord Muktheswara with his consort Goddess Subhaanandha Devi in a grand manner on the day of MahaShivaratri. Karthika Masa Utsavams(in the month of November/December). The temple is opened on all the days in a year. By Road: Direct bus service is available from all major cities/towns of Telangana state(Warangal/Parkala/Karimnagar/GodavariKhani/Peddapalli/Manthani and etc.,). By Rail: There is NO direct rail route. The nearest railway stations are Karimnagar, Peddapalli, Ramagundem, Hyderabad.